End of smoking in Pubs in Spain | Marbella Marbella – Adelante! Midsummer’s Night 2010 may well be the last time that the Spanish, residents and visitors, can enjoy a ‘smoke’ inside a public space in Spain, without fear of prosecution. June 22nd, 2010 is provisionally the day that Spain’s anti-smoking laws are expected to change, according to articles in the Spanish Press and TV. The irony on the Costa Blanca is that traditional midsummer’s night parties in honour of San Juan (St. John the Baptist) take place on the evening of June 23rd and since 1928 Alicante has celebrated with the Bonfires of Saint John, which have developed into elaborate constructions inspired by the Valencia’s Fallas. No doubt someone with a sense of humour shall build one depicting a smoker going up in flames! This action from the Ministry of Health is to once and for all bring Spain into line with many other European Countries and ban smoking in public areas. The government aims to eliminate all those areas where smoking is allowed at present. This means that there will no longer be any special areas reserved for smokers and that all bars, restaurants, hotels (which can now have up to 30% of rooms reserved for smokers), nightclubs, gaming establishments, casinos plus the designated zones in airports, bus stations, trains, shipping terminals and anywhere else presently permitted, will now have to close down these areas due to changes in the enforcement of the law. Congress still must approve this but it looks like that will have the approval of all parties. Back in 2005, Spain’s controversial Anti-Smoking Laws allowed establishments to decide if they wanted to ban smoking completely or not. More than 90% continued to allow smoking as if nothing had ever happened while others, especially restaurants and nightclubs, such as the Benidorm Palace, constructed glassed areas, to allow smoking in an enclosed space. Health Minister, Trinidad Jimenez, has explained on several occasions that the new ‘text’ is currently under study but that preliminary indications suggest that the Government will not offer compensation to anyone for any investment to provide smoking zones for their clientele. In order to remind smokers of the hazards associated with smoking, cigarette packets shall also feature 14 strong images highlighting the harmful effects of cigarettes. Rotten teeth, lung tumours or children affected by passive smoking are some of the images approved to appear on cigarette packets in an effort to reduce demand and hopefully diminish the number of new smokers, especially children. Many of these images have been used in a similar campaign in Ireland. 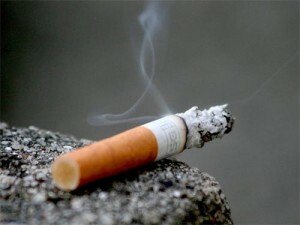 Annually, over 55,000 deaths are smoking related in Spain plus numerous cancers and illnesses. Some of the positive effects will be cleaner air, not having to put up with smoke in pubs, restaurants, over dinner or at a show, hopefully a reduction in health ailments, cancers and lung disease plus less cigarette butts dropped on the streets, to name but a few. For those smokers that may have problems facing up to a change in their lifestyle, there are a number of new electronic cigarettes available, which will provide you with a similar oral gratification and nicotine kick without the carcinogenic ill effects caused by additives plus patches, hypnoses, acupuncture and for those with real willpower, you could even go cold turkey. It’s a win-win situation for everyone in terms of health for the nation.